King Edward stamps tell the tale of two kings – King Edward VII (7th) and King Edward VIII (8th). Both had relatively short reigns, especially when compared with Queen Victoria and Queen Elizabeth II (2nd)’s continuing reign. Next year, Queen Elizabeth II will celebrate 60 years. King Edward 7th reigned from when his mother Queen Victoria died on the 22nd Jan 1901 until he died on the 6th May 1910. He waited a long time to be king. The first King Edward stamps were issued on 1 Jan 1902, almost a year after Queen Victoria’s death. There were a range of stamps issued from that date through 1913. The prices of the stamps ranged from ½ penny to £1 pound in 18 different prices that were manufactured. De La Rue printed from 1902 to 1910. And, in 1911, they were printed by Harrison & Sons. For the 1911 to 1913 versions, the printing was done at Somerset House. Of course, many other countries of the Commonwealth issued King Edward stamps during his reign. King Edward VIII reign was much shorter because of his abdication from the throne so that he could marry Wallace Simpson. He was on the throne for a period of only 11 months, from 20 Jan to 10 Dec 1936. During that time, only four official stamps were issued in Great Britain. 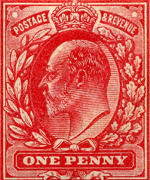 The stamps and descriptions are ½ penny green, 1 penny scarlet, 1 ½ penny red-brown, and 2 ½ penny bright blue. These were rather plain stamps of his side profile. But, what if King Edward VIII had not abdicated? What kind of stamps would we have seen until his death in 1972? Here is a question on the value of King Edward stamps (8th). 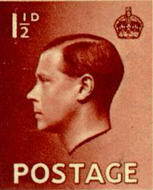 How much is the old King Edward VIII stamp worth now? My mom was going through her old stamps, and we found a really old one that has a young Edward VIII on it. We did a little research, and it said only four were made. Can you tell me how much it is worth now? I believe the four you refer to means that there were only four different stamps in the series, not that only four stamps were printed. Have a peek at link two that shows the stamps for sale at 15 pence and 20 pence, which would not buy you a donut I'm afraid. It could be that you have some sort of special stamp with rare markings, but I'll wager you do not. If in doubt, take it to a stamp dealer and ask.